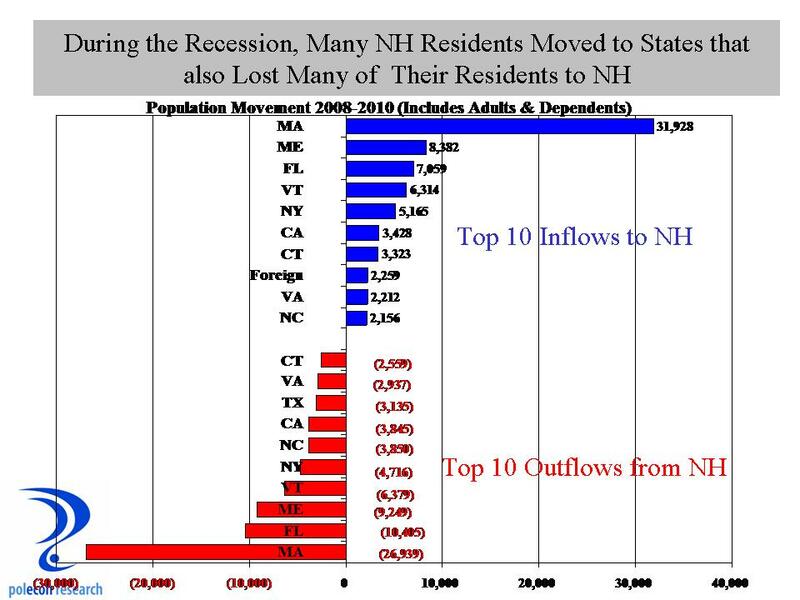 What’s Behind NH’s Recent Net Out-Migration? I’ve written often about how important the ability to attract skilled, well-educated individuals is to NH’s past and future economic success. Appropriately, there is much concern over NH’s recent population losses resulting from movements of residents into and out-of the state and what it says about NH’s relative attractiveness. Not surprisingly, that concern results in many simplistic, inaccurate, and analytical flawed explanations for the patterns of migration to and from NH. I don’t have a book, video, seminar, or anything else to sell that depends of any particular explanation for NH’s migration patterns so I will let the data , as it becomes clearer, shape and evolve my theories on the phenomenon. Here is the basic scenario: NH has traditionally been a magnet for residents moving from another state (most prominently from another Northeastern state – especially MA). During the past decade NH has attracted less net in-migration from other states, especially during the second half of the decade, culminating in net out-migration at the end of the decade. The resulting concern by many (including me) is that NH may be losing its fundamental attractiveness relative to other states. Because NH has relied on in-migration to fuel growth in “human capital” and the economy, this would imply very bad things about the future of our state. I worry a lot about NH’s attractiveness but my answer to the question of whether the state has lost its attractiveness is: “no…….not yet“. Lets look at migration to and from the state during the recession (chart below). During the recession the patterns of the past several decades were largely the same – albeit with different magnitudes. 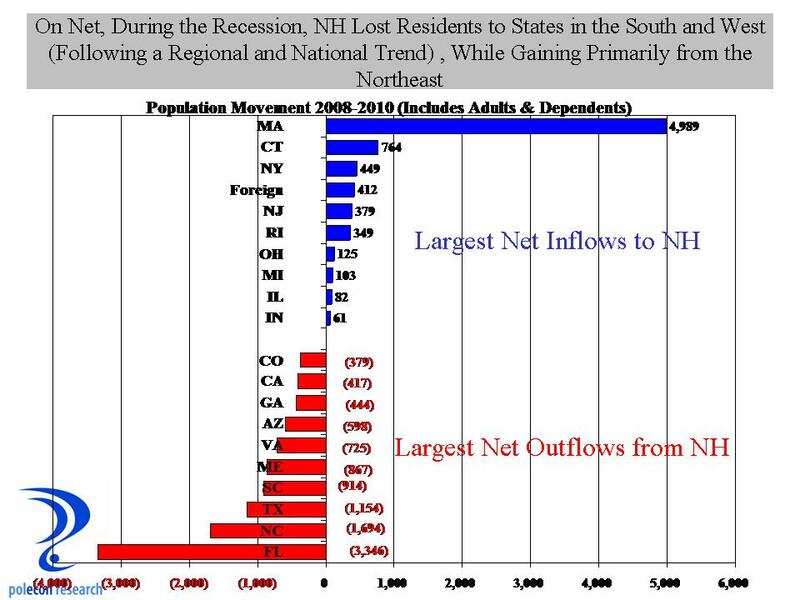 NH gained and lost a lot of residents from other Northeastern states, and smaller numbers from other states in the South and West. Because of the housing market bust and subsequent housing equity, credit and financial issues, both the selling and buying of homes were disrupted or impossible for large numbers of homeowners in NH and across the country. That has especially profound impacts on net migration to NH. I can’t explain in detail here, but migration patterns in NH indicate that the state has been especially attractive to and a magnate for 30-44 yr. old, two wage-earner married couple families with children. To move to NH they typically have to sell a house in their native state and buy one in NH. Each of those was a lot more difficult at the end of the last decade. I believe this reduced our core demographic of potential in-migrants. At the same time, the housing market crash had less of an effect on the ability of the young, and non-homeowners to move from state-to-state. This is the demographic group that traditionally has shown net out-migration from NH. So the groups most likely to choose NH were most constrained from doing so during the last half of the 2000s, while the groups most likely to leave NH were not constrained from doing so by “housing lock” or other housing market issues. The result – much lower rates of net in-migration to the state. This explanation doesn’t account for all of the recent decline in net migration to NH, but it surely has played a significant role in the trend. This entry was posted on November 1, 2012 at 11:28 am and is filed under Demographics, immigration, in-migration, NH, NH Economy, out-migration, Recession. You can subscribe via RSS 2.0 feed to this post's comments.